The Clean Sweep skincare brush, face wash and moisturiser will get your skin in shape in no time. Engineered for men’s skin and beards to leave it clearer, stronger and more resilient. 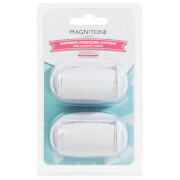 Deep cleanse pores, tone and remove hard skin with our devices for beautifully conditioning your face, body and feet. Award-Winning technology will make sure skin is well behaved every day, no surprises! Don’t lose your buzz! Replace your cleansing brush heads and pedi rollers every 2 months. Go global with our travel cases and handy shower holders or remove makeup with just water using our MicroFibre cleansing cloth. Vibra-Sonic™ technology gives you the ultimate cleanse to remove trapped dirt, sweat, bacteria and pollution from skin pores. The 15,000 RPM motor gives a toning skin workout whilst precision moulded silicone gently exfoliates, even under facial hair. Discover Magnitone London- the Award Winning cleansing brand for men and women. Featuring our unique, gentle Vibra-Sonic™ technology that deep cleanses and beautifully conditions skin- suitable for all skin types. 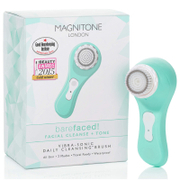 The unique combination of pulsations and oscillations, vibrates pores to release trapped impurities from skin, leaving it naturally balanced, clear, soft and healthier looking- noticeably different, right from the first use.